If you are tired of the midtwon/uptown scene and commericalism of the Times Square hustle and bustle, there are many options in New York popping up each year. The Thompson Hotels and the Lower East side have become a bit of an infatuation for me as I feel like the Lower East Side is not for tourists, but more for the locals and I remember my days fondly working in NEw York. The Thompson LES is a chic artsy high tech luxury hotel. This hotel appeals to those who like modern industrial decor with lots of leather and frosted glass that you can imagine would be the way a New York bachelor would decorate his room. Silver, white and black are the main colors of this hotel. Luminaries such as Madonna have held parties here so you know it is up to snuff. The signature mark of this hotel is the unique outdoor pool deck on the third floor. It really isn’t a large functional pool more than it is a small lap pool and conversation piece. It’s more for art show than anything. There is a photomural of Andy Warhol on the bottom of pool, although hard to see through murky waters. Adjacent is a also a small gym, a guest only bar on the second floor overlooking Allen St., and a restaurant as well as 24-hour concierge service. The Lower East Side of New York offers a great area to walk that is non-commercial and extremely diverse sandwiched bwetween SoHo, Little Italy, and Chinatown. Just three blocks away across Delancey St. is Chinatown, but you are right in the heart of the rock’n’roll club and lounge scene as well as near Clinton St., New York’s Restaurant Row. Just a note. This is truly a local’s neighborhood. If you don’t cab it, you will have to valet park your car or risk your car on the street. The hotel is a unique experience from the neighborhood, to the beautiful rooms, to the great service and safe and friendly atmosphere provided by the staff. Located just south of Houston St. and north of Delancey. It is conveniently located near numerous restaurants and stores within walking distance. As I mentioned, this is not commercial Manhattan. You won’t find a Starbucks or an Abercrombie here but they are instead replaced by tattoo parlors and head shops. Check-in was quick and friendly. I felt a bit out of place coming from a conference as everyone else checking in seemed to have instruments with them. There’s something about seeing people checking into luxury hotels with holey jeans and CBGB rock’n’roll t-shirts. There was a rock band checking out as we checked in. Sandwiched in between the niche boutiques and eateries are some of New York’s best late night music clubs like the Living Room and the Mercury Lounge, featured in the 2008 movie, Nick and Nora’s Endless Playlist. Just a year old, this hotel is on the upper end of the Thompson Hotels cost range and its chic style has bands and celebrities staying here frequently. If you book through Quikbook.com, you can get one of their lower end rooms for $175, but prices for the bigger rooms go for $450 and the biggest suites will be in the $800 range. I have to thank my wife for the stay at this hotel for my birthday. It was a perfect date night out after a long year. Rooms with balconies are not available online. you have to call reservations to specifically ask for those rates. The hotel has an outdoor covered bar for guests only and was perfect for a nice drink or breakfast in the humid New York air. There is also an indoor restaurant dining area which I did not use. You can get to the third floor pool deck via the elevators or up the stairs from the restaurant. I was excited to see this feature but found the water to be a little cloudy and the Andy Warhol photo mural was difficult to see at the bottom of the pool. The spa and workout room area all located on the third floor as well. My king deluxe corner suite was quite spacious. In fact I might say my bathroom was larger that a King Deluxe room at the sister hotel, 6 Columbus. I was told however that I would not like the King Superrior room and find it to be a little cramped for more than one night’s stay. The bathroom is enclosed in frosted glass walls. When walking into our room the bathroom was on the right and we slid open the frosted wall to reveal a single raised sink bathroom with a very Japanese feel and lavender bath products by C.O. Bigelow that impressed my wife. The walls were not stone but a very smooth gray cold concrete. Behind the frosted glass door on the right was the toilet. Behind the glass door on the left was a separate shower and tub. The shower has a waterfall spout suspended overhead as you enter the room and drains into the floor. The sitting room has two flatscreen televisions back to back. One for watcing in bed and the other when sitting in the living area. I think they could have just prchased a nice swivel tabble instead. The predicatment is that if both TVs are on (yes I tried it) you would change the channel on both TVs. There was a nice leather couch sitting area with a wet bar. Overlooking the Bar over Allen St. In case you are wondering, the sitting room does allow you to look into the shower area. So if you are staying with someone in the room, they would be able to see a vague silhouette when bathing, but you really can’t see anything. 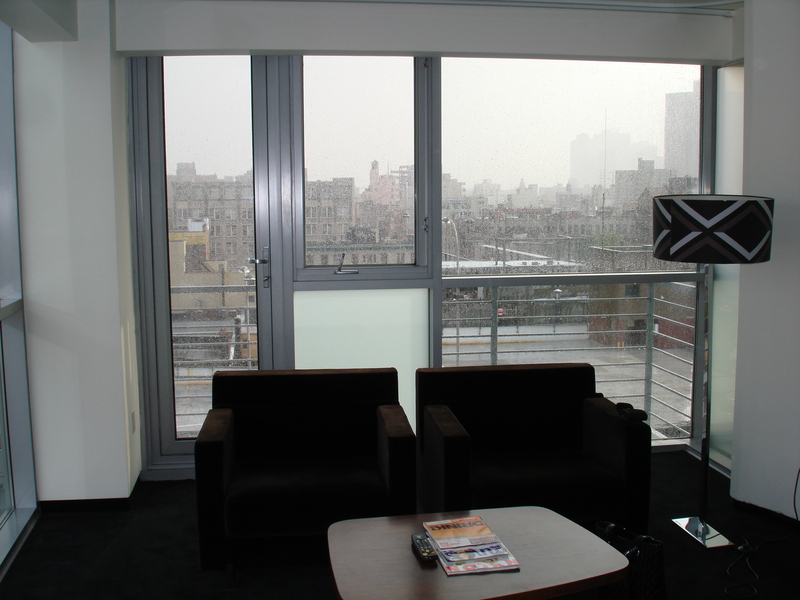 The sitting area does open onto a balcony where you can see up and down Manhattan. A couple notes here are that the balconies are all on the west side side of the building and all rooms with even numbers (we had room 600) have those balconies and look over Allen St. on the noiser side of the building. I was told that you have to call and request a balcony room as they are not specified when making reservations. The balconies are contiguous so you must lock your doors when you leave the room as people can walk over to the balcony area outside of your room.Outside bar overlooking Allen St. The centerpiece of the room is the bed. A kingsize bed with a large photobox of a winter black and white photo as a headboard. The one quirk about this hotel is the light switches. They are black on black walls and are hard to find and it took us several minutes to turn off the headboard. Additionally the light switches have these small levers on the side which brighten and darken the lights. It confused us for a while why the lights weren’t working properly. There are small built in closets as well as a desk work area, although I don’t think much work gets done at the desk. 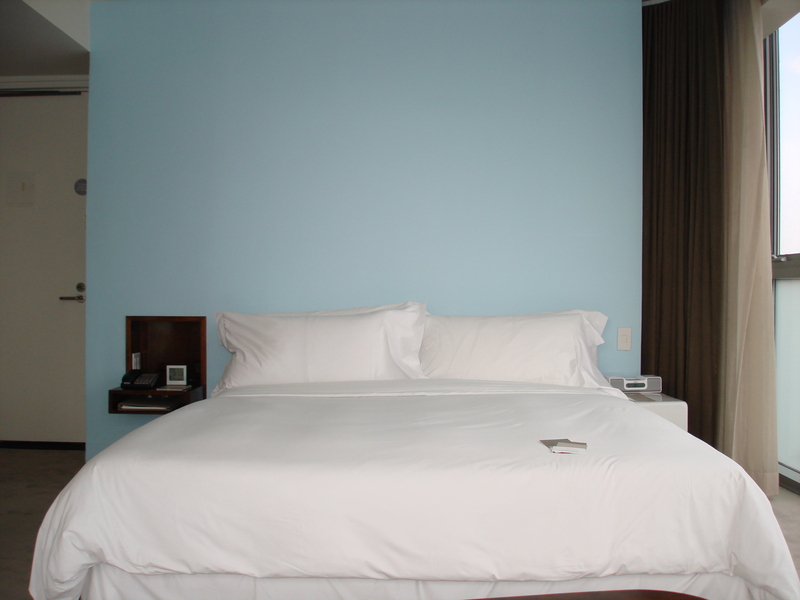 The firm bed featured Italian sheets soft feather down pillows, a large duvet cover, yet no topsheet. There were only side bed mats on the floor and since we were at the hotel in the middle of the summer on the black painted wood floors, that was oka,y but I would guess those floors get cold in the winter. Overall a wonderfully beautiful hotel that is pretty pricey. We ate on Rivington St. at Schiller’s Liquor Bar for dinner and had breakfast once again at the Clinton St. Bakery, a favorite of Martha Stewart! There are lots of great places to eat in the area from vegan to sushi. My wife and I noted that we felt like we were in another country as we heard all kinds of languages except English as we walked the streets at night. If you are looking for a great hotel with a young nightlife, this hotel is one you must try. I’d go soon though as it is only a year old and I could see it getting old and worn down in some areas already. I’d highly recommend but I am not sure I’d come back to this hotel only because of the price and I have so many more to check out! Hotel Decor: 87 Hip Luxury with a chic Ikea 60’s feel although not always the most functional of decor. Furniture is not of high quality. Hotel Amenities: 83 There is a Rooftop members Lounge and the Blue Ribbon Bar and Sushi Grill is located in the lobby. Blue Ribbon Restaurant is considered a top 100 restaurant in NYC. Concierge is 24 Hours as it is necessary in NYC where you are always in need of something. The City never sleeps! Neighborhood Scene: 90 The streets are teeming with traffic all night long around Central Park, Columbus Circle and the Time Warner Center. 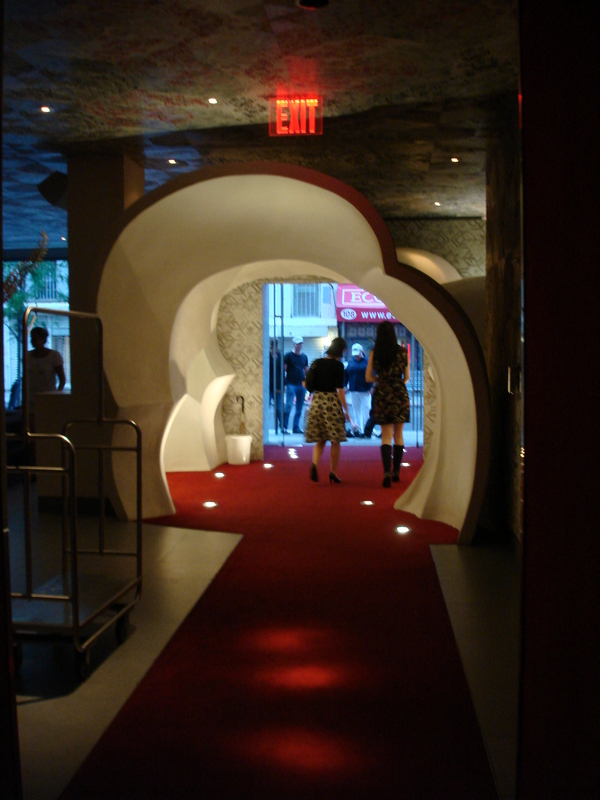 If the scene isn’t good in the hotel, head on over to the Hudson Hotel or walk a few blocks down to Times Square. Miscellaneous: There is a Starbucks next door and another 24 Hour Starbucks two blocks away on 60th. Best Buy is on 60th as well for any electronic needs. Need some clothing, the Time Warner Center across the street has all you need. Overall Wow Factor: 85 the hotel is small and after a night or two the coolness factor wears off. Hey, you aren’t here in NYC to hang out in your room. 6 Columbus, a Thompson Hotel, is located in midtown Manhattan just off of Columbus Circle. It really is on 58th St. (between 8th and 9th, so don’t get confused. It is conveniently located across from the Time Warner Center and is just across the street from the 59th and Columbus Circle Subway station and Central Park. Other “within walking” destinations (5 blocks) include Carnegie Hall, Times Square, MOMA, Rockefeller Plaza, and the Lincoln Center. The hotel has 88 rooms and suites with only 3 rooms per floor facing the street and three rooms facing the back. My room #607, faced out the back looking into people’s apartments. The Thompson Hotel chain specializes in boutique hotels with chic interior designs and 6 Columbus is no exception. I took advantage of a special rate of $179/nt for a King Deluxe room after an upgrade through Quikbook.com. The hotel has a small sushi restaurant (Blue Ribbon) in the lobby which also has a small seating area. Check in was quick and very helpful. The walls are a covered with a black fabric that resembles cowhide. In fact all the public walls are that way. Along with a dark blue paint job, the public areas are fairly dark and during my 4-day stay I constantly had to search for the elevator buttons due to the dim lighting. Additionally, the wireless internet ($10/nt) was a little slow as it was not able to download YouTube videos. My room was fairly small. They advertise pod rooms for a really cheap price, but I was told they were VERY small. The room has a unique look to it with the centerpiece being a wall photo of a woman that I could not identify. I tried to work at the desk and the issue was that all the plugs were covered so I had to unplug the lamp in order to plug in my laptop. Traditional items missing from the room were an iron, an ironing board and a hair dryer. All of these items were available from the front desk as needed though. I was told that the hotel chain prefers to keep non-aesthetically pleasing items as well as hazards such as hot irons out of the room. Once again using the iron in my small room was difficult even trying to find a Additionally, the room does not have a closet but rather a small modern armoire-like cabinet that would not fit a large suit bag or suitcase. The bathroom was made of black tile and a glowing circular lit mirror and equipped with soaps and hair products from Kiehls (favorites of mine). Like most boutique hotels the room also had an iHome which is useful for docking my iPod nano. The only problem here was the my iHome was broken and my iPod did not play on this one. The bed was extremely comfortable and I had no problem sleeping at night. The room was aesthetically pleasing but overall a little uncomfortable and small for my own taste. My room did have a nice feel to it though although I wouldn’t recommend it for a long stay or for luxurious travel. As I mentioned, the hotel is central to the Time Warner Shopping Center complex and the subway is only a 20 minute ride to Yankee Stadium. Just a walk down the street will take you to the very sceney crowd at the Hudson Hotel where you can get your groove on to DJ music with a very good looking crowd aged 20-50, although I would venture to guess most of the 50 year old guys were with 20 year old women. For baseball purists I’d avoid the ESPN Zone in Times Square and head over to 59th St. (Central Park South) and check out Mickey Mantle’s Sports Bar where you can see more games at one time. You can also head across to the famed FAO Schwartz toy store. The Hotel on Rivington (www.hotelonrivington.com) lived up to all the hype for me. Located on the Lower East Side, it is a great escape away from all the hustle and bustle of Midtown Manhattan. The often unexplored LES offers a vibrant nightlife with clubs, restaurants and some unique shopping. The hotel is a sleek contrast to the rest of the neighborhood and really does stick out like a sore thumb. Despite all my usual research I was not quite ready for the entrance to the hotel with it’s white modern sculpture entrance which felt like entering the Matterhorn at Disneyland. Secondly, I wasn’t ready to find that the reception desk was on the 2nd floor. I was so eager to see my room ( a corner with a glass shower) that I didn’t even bother to check out the lobby until I checked out. When you get to your floor, the halls are black with no windows and you just follow the glow of the red light to your room.The lack of lighting adds to the shock factor when you enter your room with floor to ceiling windows that offers sweeping views of the LES bridges, with Delancey St. below and Wall Street in the distance. The room fit the images of the photos on the website except my bathroom was black tiled compared to the yellow one I saw on the site. For all you exhibitionists out there, it should be noted that the glass shower uses frosted glass so there is really no chance of being seen from the street below.The muted cauliflower blue and brown colors fit well with the design of the room complete with automatic sliding curtains, free wi-fi, balcony and flatscreen TV. This is definitely a rock and rollers hotel. For those who like celebrity watching (raising my hand) we spotted Sarah Michelle-Gellar here as she was having a “wrap Party” for her new movie.The Hotel on Rivington towers over the LES. Once we dropped our items in the closet we explored the great stores for boutique clothing, found a restaurant for the evening (Tre) and scoped out restaurant row (Clinton St.). Although the hotel has its own restaurant, Thor, we wanted to escape from the touristy feel and have a nice casual dinner in the neighborhood. Tre is located just around the corner, one block north of the hotel and offers a quiet scene in a shotgun style restaurant with lots of good people watching as well as a great place to eaves-drop on the interesting lives of the people who live in this eclectic neighborhood. We had the prix fixe meal which was a little salty but that wasn’t why we went there. The interesting site was the tall British gal in her white hostess dress. At one point this striking gal snapped on some rubber gloves, threw a large piece of prosciutto on the table and sliced it right there fresh for the patrons. It was a scene that you’d have to have seen just to visualize the oddity. Afterwards, we bar hopped, checked out the “Livingroom” , a small live music joint and then back to Thor for a drink. We left our shades open and got up early the next morning for breakfast at the Clinton St. Bakery. I’ll discuss that at another time, but located three blocks from the hotel on Clinton and Houston, you will find the best blueberry pancakes (okay Martha Stewart discovered them first) that are just one more reason to stay down in the LES. I highly recommend the Hotel on Rivington. We didn’t get to truly experience the hotel, but the small taste that we got was enough to get us to come back to the hotel and its great neighborhood. The furniture , the interior design and the ambiance were spot on.